Save time when creating projects and watch your costs and profits per any man-hour by setting up your people's hourly rates. The profit you make from each person’s worked hour (Profit) is the difference between the hourly rate you sell that person’s work to the client for (Project rate) and the overall cost of your person’s man-hour (Total hourly cost). The standard client rates are defined on the client detail page. However, it can happen that you and the client make an exception and charge them a different rate on a particular project. It is therefore required to change the Project rate, but retain the standard Client rate. This is of course possible. Just enter a different Project rate using the Edit activity rates – the Client rate will remain intact. 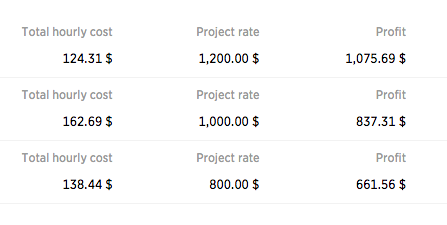 When adding freelancers who track time on your projects, you have to define their hourly rates. If you need to make an exception and arrange a rate different from the usual, but don’t want to change their standard rate, it’s also possible. Just click the Edit personnel rates button.